Located in the Sandhills of Cherry County, Nebraska, the settlement of DeWitty was established in 1908 by black homesteaders who constructed housing made of stacked sod. These settlers farmed some of the least hospitable land in the state. The families were spurred to the area by the 1904 Kinkaid Act, which allowed settlers to claim large-but-undesirable parcels of land with poor irrigation and little vegetation. Those who accepted the challenge were known as Kinkaiders. Among the first to arrive in 1907 were Charles Meehan, born in 1856 in Detroit, Michigan, the son of white parents who had immigrated the previous year from Counties Tipperary and Fermanagh in Ireland. Charles had moved with his mother to Canada as a youngster. Joining Charles in the move from Canada to Nebraska was his wife Hester Catherine Freeman, born in Canada in 1856 to a Canadian father and a mother from Baltimore, Maryland. According to Catherine Meehan Blount, their granddaughter, Charles and Hester left Canada for Nebraska in 1885 with their oldest children and the families of Joshua Emanuels, George Brown, and William Crawford. 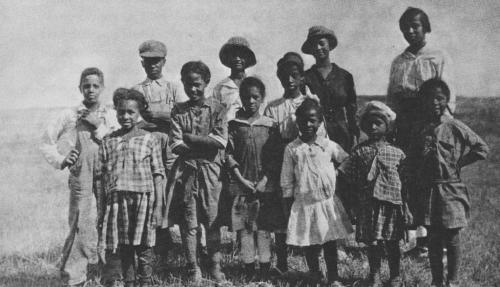 Other early black homesteaders included Clem Deaver and Robert “Daddy” Hannahs. Meehan’s granddaughter, Ava Speese Day, later wrote about their experiences on the Plains in Sod House Memories. They settled in an area along the North Loup River near Brownlee, calling their town DeWitty, after the first postmaster, Miles DeWitty. In 1916, a change in postmasters prompted a change in the town name to Audacious, followed by a post office relocation two years later to the town of Gard. For a while, the homesteaders found some success as ranchers raising beef cattle, mules, poultry, and hogs. A few had dairy cows and sold surplus product in nearby Seneca. Even though they were in the proximity of the North Loup, few of the black settlers were able to claim land with water rights or even grazing meadows. So most had to purchase hay for feeding and lease easements for water access, adding to their financial burden. To make ends meet, some men worked as freighters or laborers for neighboring white ranchers while women washed, worked in kitchens, or served as midwives. The town of DeWitty/Audacious included a general store, the St. James A.M.E. Church, and three schools. Books were borrowed from the State Library at Lincoln through a program to service rural families. Other supplies were purchased through trips to Brownlee or Seneca, or mail order from Sears, Roebuck and Company. During the early 1920s, the town had an all-black baseball team called The Sluggers, which played several undefeated seasons. However, by that time, most of the original homesteaders had found the land unprofitable and had left the area. In the late 1980s, only one ancestor of a black settler still owned land along the North Loup. On April 11, 2016, a dedication ceremony for a new Nebraska State Historical Marker in Cherry County commemorated DeWitty as the longest and most successful African-American rural settlement in the state. Sources: Jon Farrar, “Black Homesteaders: Settling the North Loup Valley,” Nebraskaland 6:6 (July 1988); Jon Farrar, “Black Homesteaders: Living Off the Land,” Nebraskaland 6:7 (August/September 1988); Jon Farrar, “Black Homesteaders: Scratching Out a Living,” Nebraskaland 6:8 (October 1988); Jon Farrar, “ Black Homesteaders: Remembering the Good Times,” Nebraskaland 6:9 (November 1988); John Kay, David Anthone, Robert Kay, & Chris Hugly, Nebraska Historic Buildings Survey: Reconnaissance Survey Final Report of Cherry County, Nebraska (Nebraska State Historical Society, May 15, 1989); Frances Jacob Alberts, ed., Sod House Memories, Vol. I-IV (Hastings, Neb. : Sod House Society, 1972); Stew Magnuson, "Dedication Ceremony for DeWitty Historical Marker Set for April," The Highway 83 Chronicles, Jan.11, 2016, http://ushighway83.blogspot.com/2016/01/dedication-ceremony-for-dewitty.html. Jon Farrar, “Black Homesteaders: Settling the North Loup Valley,” Nebraskaland 6:6 (July 1988); Jon Farrar, “Black Homesteaders: Living Off the Land,” Nebraskaland 6:7 (August/September 1988); Jon Farrar, “Black Homesteaders: Scratching Out a Living,” Nebraskaland 6:8 (October 1988); Jon Farrar, “ Black Homesteaders: Remembering the Good Times,” Nebraskaland 6:9 (November 1988); John Kay, David Anthone, Robert Kay, & Chris Hugly, Nebraska Historic Buildings Survey: Reconnaissance Survey Final Report of Cherry County, Nebraska (Nebraska State Historical Society, May 15, 1989); Frances Jacob Alberts, ed., Sod House Memories, Vol. I-IV (Hastings, Neb. : Sod House Society, 1972); Stew Magnuson, “Dedication Ceremony for DeWitty Historical Marker Set for April,” The Highway 83 Chronicles, Jan.11, 2016, http://ushighway83.blogspot.com/2016/01/dedication-ceremony-for-dewitty.html.